A little over a year ago when my now toddler was starting to eat solid foods, I wanted to add yogurt to his daily meals. Yogurt is an easy to digest source of protein and calcium that is also full of “good” calories, and I hoped that it might help satisfy his insatiable appetite. So, I went grocery shopping and spent some time in the dairy section reading yogurt labels. YoBaby was the most prominent brand and there were lots of delicious flavors that I knew my little one would love. But there was just one problem: sugar was the second ingredient on the label. At least 9 grams of it! To add to my confusion, there was a little asterix on the Nutrition Facts label that said “includes natural milk sugar.” Just how much added sugar was in the little 4 oz baby yogurt cup? Was it a tiny amount? Was it almost the full 9 grams? I had no way of knowing. 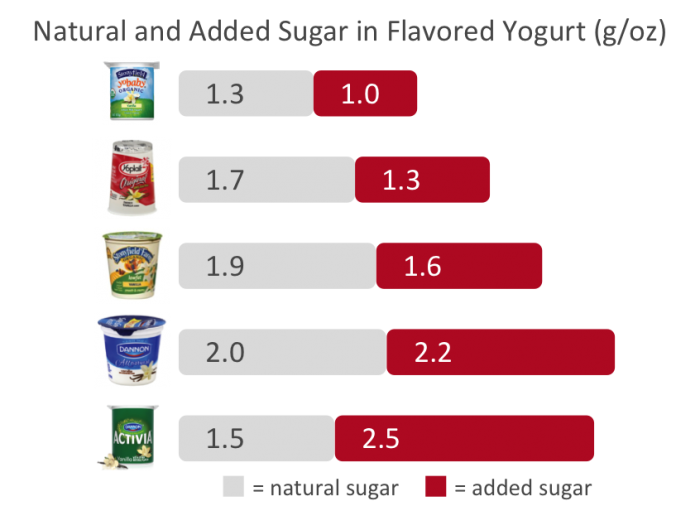 Note: it will be easier to make an informed choice about flavored yogurts and other foods that contain added sugar in 2020 when food manufacturers are required to implement the FDA’s updated Nutrition Facts label (read more about added sugar). What do you do when you don’t know how much added sugar is in a packaged food? I tried plain yogurt, but my baby wouldn’t eat it. When I grew tired of cleaning yogurt off of the table, his bibs, and the floor I started to make my own flavored yogurt. I used fresh, frozen or canned organic fruit (peaches were his favorite) and sweetened it with just a touch of maple syrup. Wow did he love it… for a month or so until he decided he wanted “bigger kid foods”. Update: this is still a food my now 2 year old asks for, especially when he is feeling under the weather. Not being content to wait until 2020 when food manufactures are required to disclose added sugar on their packaging, I decided to calculate it myself. I wanted to know just how much sugar was in the commercially available yogurts so that I could have a go-to option in a pinch. I went to several yogurt manufacturer websites and looked at their nutrition information for their plain and vanilla yogurt products. Vanilla was selected as the flavored yogurt so that my “math” would not be complicated by any natural sugar from added fruit. The only natural sugar present in the yogurts would be from lactose, a natural milk sugar. Note: When a manufacturer didn’t offer a plain version of their yogurt, I used a “light / lite” version with artificial sweetener in its place. 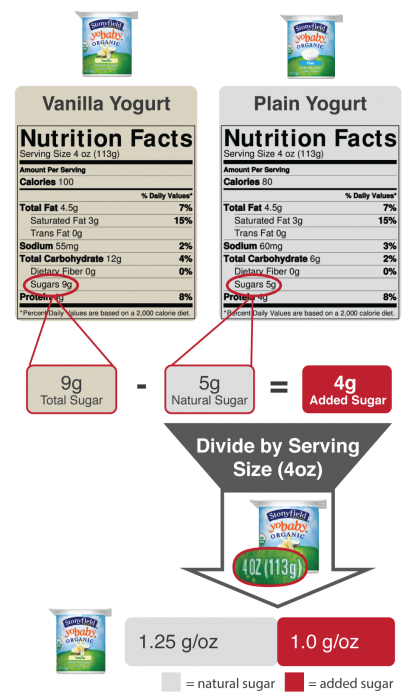 All natural and artificial sugar values were reported as grams per ounce (g/oz) because of varied serving sizes among the different brands. Note: one teaspoon of sugar is equal to 4 grams of sugar. It turns out the YoBaby doesn’t have that much added sugar. At 1 g/oz or 4 grams per serving, it was definitely lower than the other flavored yogurts. However, it is still a teaspoon of added sugar per little 4 oz yogurt cup, and that can really add up. Note: one teaspoon of sugar is equal to 4 grams of sugar. 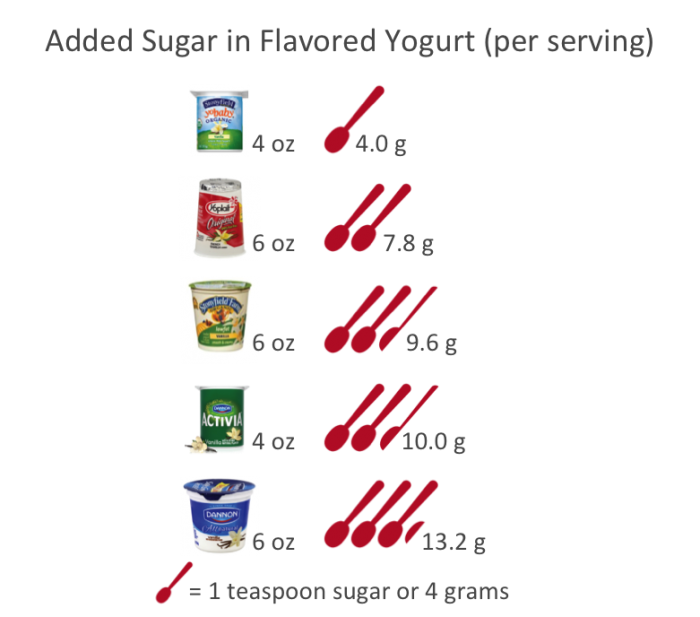 To put this into perspective, below is a chart with the total added sugar per serving for each of the vanilla flavored yogurts. The YoBaby yogurt has a teaspoon of added sugar per serving, which isn’t that much. However, the same size serving (4 oz) of Dannon Activia contains 2.5 teaspoons (10 grams) added sugar. And the Dannon Vanilla contains 3.25 teaspoons (13 grams) of added sugar. Knowing how much added sugar you are eating is important. If you love flavored yogurt, then by all means eat it. Just be aware of how much added sugar you are consuming, and look to reduce added sugar elsewhere. A key lesson is that flavored yogurt is not inherently healthy. I hope this information is helpful as you try to make wise choices about the foods you eat and feed your family. For me, it has altered my buying habits from a favorite fruit on the bottom greek yogurt to a plain greek yogurt. The transition has been relatively painless for our family (my husband and I, the boys still will not eat yogurt). We top our yogurt with thawed frozen blueberries or fresh berries if we have them and healthier homemade granola. Personally, I am saving my daily allotment of added sugar for a little chocolate or a gin and tonic at the end of the day. Interested in learning more about added sugar?